I have been craving for Malaysian Shang Yuk Pau for a long time now. This is my 3rd attempts on this pau and is by far the best and I had two immediately when it was out of the steamer! 1. Knead together all the ingredients listed under dough and form a soft dough, covered it with clean cloth and leave it at warm place to raise to double its size. Turn the dough on a working space, evenly sprinkle baking powder over the dough and knead further for 5 minutes until the dough become smooth on the surface. 2. Mix all ingredients listed under filling (beside chopped spring onion and egg), you could add the water and stock slowly. Mix the meat and seasoning well and leave it in the refrigerator for 20 minutes to marinate. 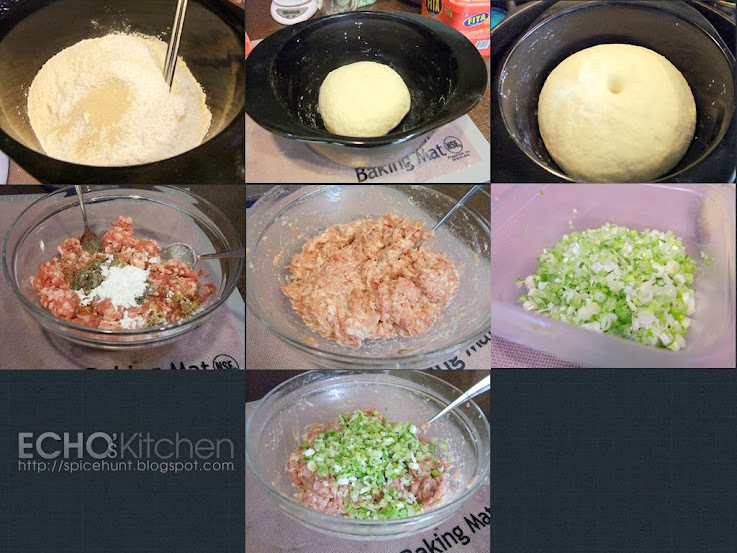 Add chopped spring onion only before making the pau. 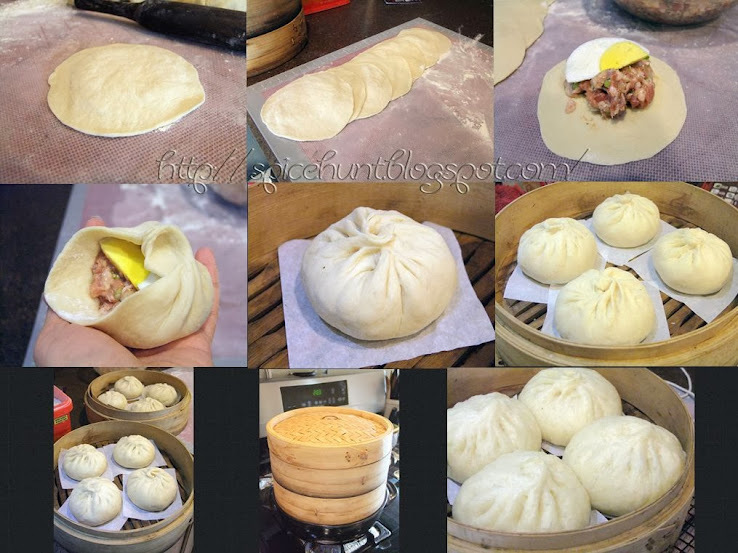 3.Divide dough into 10 or 15 equal portions, depending on the size of pau you want to make. Use a rolling pin to roll out a portion of dough in such a way that the edges are thinner than the center. 4. Place 1-2 tbsps of fillings and quarter hard boiled egg in the center of the flat disc. Wrap and pleat to form a bun with flowery shape on top. It is important to proof the buns for 15-20 minutes before steaming. 5. Boil water in a steamer/wok, add 2 tbsp of vinegar into boiling water, this can enhance the color of pau and make it whiter in color. 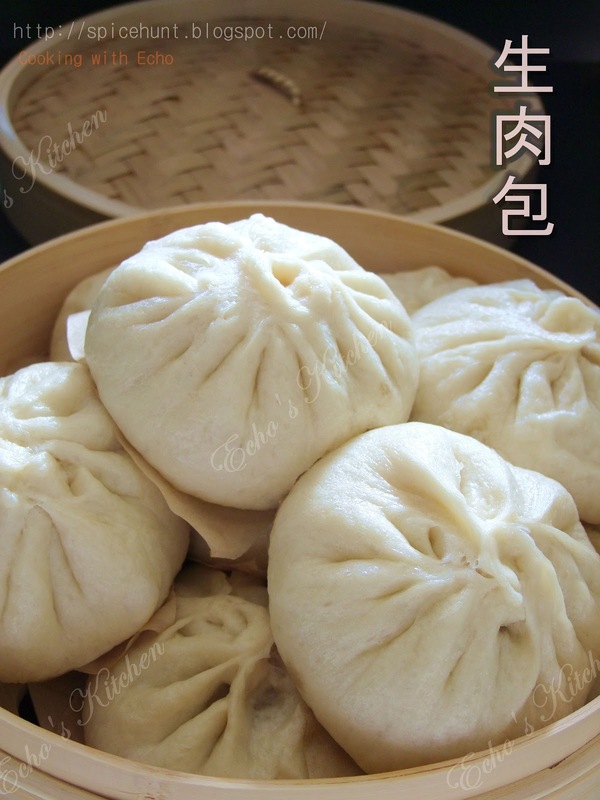 Steam pau over high heat/rapid boiling water for 15 minutes. 6. 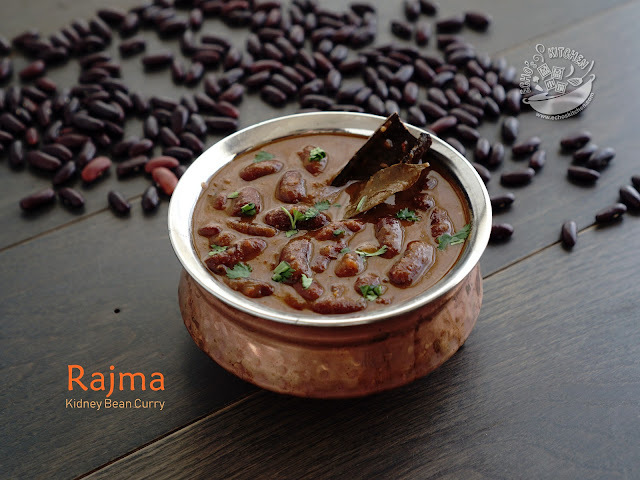 Remove the whole steamer immediately from stove, DO NOT open the lid at this point of time. Wait for at least 5-10 minutes before you check on your buns. Here is my Shang Yuk Pau for dinner Yummy.. and burp!!! oh yes.. me too loves sang yuk mee!! welcome to my blog Victoria!! Will pay you a visit right away! When we were young, my dad used to buy us varieties of pau for supper. I usually pick the shang yuk pau because I love the egg inside. Thanks for sharing the recipe. I have another recipe to try on my list now. yes... I have similar memories... I always pick char siu pau! !